For more than 10 years, Ophonius develop his musical atmosphere around original compositions, bringing a personnal reading of current music. Impulese: it's the word than define the most the quintet's music. First outstretched, like a bridge thrown between jazz fields and the far lands of the world music. Then bending on soft and warm melodies. The blow, cornestone of the saxophone trio, melt into a polychrome sound scheme, at the crossing of jazz, improvisation and art music. 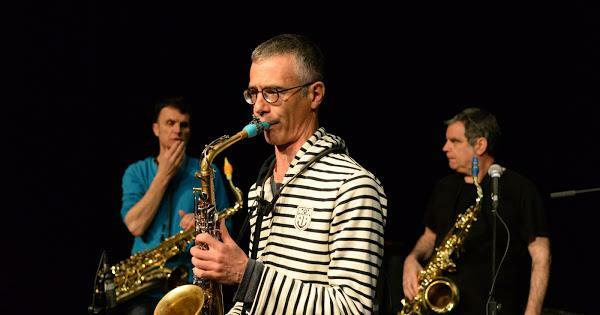 The drummer Fabien Eckert, invited on the second album, and the bassist Olivier Battle more recently, joined the band to bring the percussive energy of jazz into the music of the saxophone trio. Ophonius played in many festivals like Europa Jazz, Les Rendez-vous de l'Erdre, Jazz Altitude Festival, Alma Jazz festival... Two albums have been recorded: Helvetic Atlas (2004) and L'Azur du Globe (2008), the third is currently under preparation. The musicians of the band (including two researcher in acoustics passionnate about music) also present their music through the Scientific concerts, a pedagogical musical journey in the world of physics and acoustics.